Future Teachers Shine at MELS Garage! 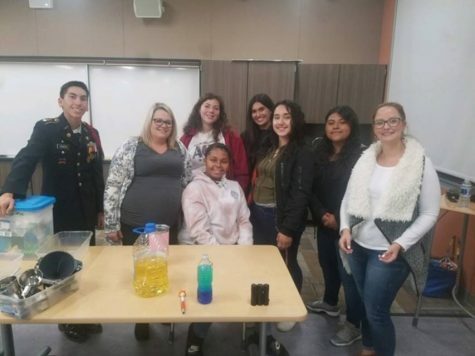 Future Teachers, an on-campus club designed to create interest and real-world connections to the field of education, hosted a workshop for elementary students during a MELS Garage evening at the MUSD District office. MELS (an anacronym for Manufacturing and Engineering Learning through STEM), hosts various meetings and workshops throughout the year. It is an excellent place for our students to go and learn about the great opportunities to learn more about real-world connections to what we are exploring and learning here at Weston Ranch. During their presentation, students from WRHS demonstrated their science knowledge as they performed a lab in viscosity (the property of a fluid that resists the force tending to cause the fluid to flow). The objective was to make a “Groovy Lava Lamp.” The students designed a lesson plan, developed a strategy, and created a prototype. Pretty impressive stuff! The student-led demonstration showed another reason why our school is top-notch, and we have terrific students. Well done!